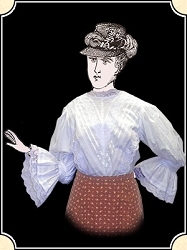 This ribbon-trimmed elbow-length sleeves with lace trimmed ruffle buttons in back for great comfort. The front is done with diagonal lace and ribbon. A square neckline with gathered elbow-length sleeves is eyelet or fancy lace trimmed with a center-pointed hem worn either tucked in or out. 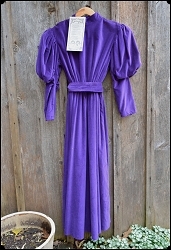 This lovely dress is Velvet and made by Recollections, wrap yourself in luxury.